Regen Projects is presenting its fourth exhibition with Glenn Ligon, the prominent New York-based artist who has established himself as one of the strongest voices in American contemporary art. Well, it’s bye-bye/If you call that gone, featuring three bodies of work, adopts its title from the lyrics of the blues song “What’s the Matter Now”, projecting Ligon’s interest in text as a mode of expression and an agent of collective identity. Come Out, a series of silkscreen paintings on canvas, for example, underlines Ligon’s oeuvre not only as an artist but also a cultural and historical analyst who utilizes elements from American history and the arts, placing archival materials into a contemporary context. In the namesake composition by composer Steve Reich, Daniel Hamm, one of the six young African-American men wrongfully accused of killing a storeowner in Harlem in 1964, recounts how he had to open his bruise and let some of the blood come out to prove the police brutality he was faced with upon his arrest. Reich, in his two channel audio piece puts the phrase ‘come out to show them’ on a loop to decode and abstract the dread of the expression within its context, shattering the harmonious and informative nature of human speech. 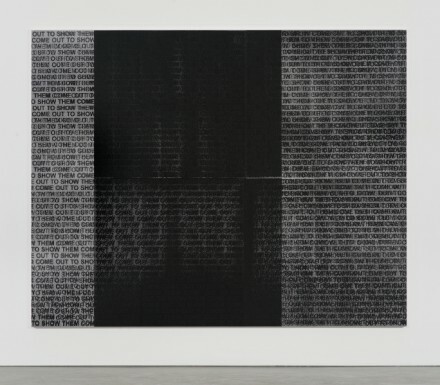 Ligon, similarly, performs the work through his printmaking, repeating the same phrase on canvas in dark tones, complicating the beginning and the end of the expression, while composing an alternative aesthetic through reiterating letters. 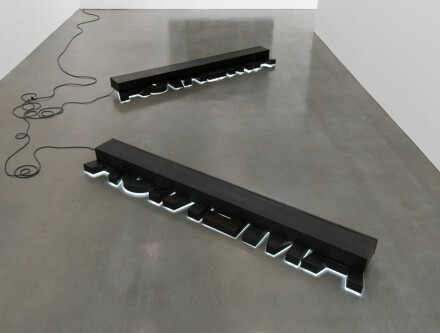 Neon texts, another signature component of Ligon’s practice, are placed facing the floor, indicating the word AMERICA with the radiance of neon lights dimmed due to their upside down positioning. Supported by steel backings, these two neon signs articulate language as a signifier of phenomenons, as well as an emblem of meanings. 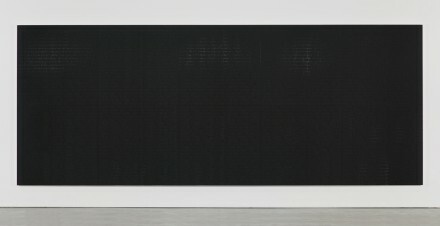 Akin to the artist’s repetitious silkscreen prints of a historical phrase, Untitled (America America) equally embodies and dismantles the borders of textual meaning. 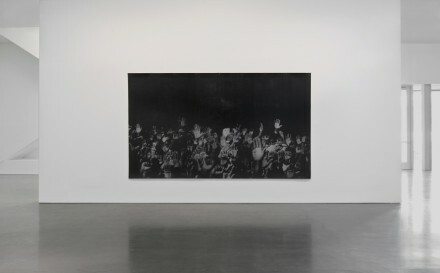 Continuing Ligon’s work as a historical archivist is Hands, a large scale silkscreen print that stems from an anecdote during the Million Man March of 1995. Ligon focuses on the moment when the Minister Louis Farrakhan, who also was the organizer of the march, encouraged the crowd to lift their hands for social justice and equality. Enlarged and reprinted multiple times with a black and white Xerox photocopier, the image adopts a grainy and rough layer due to this modification process. 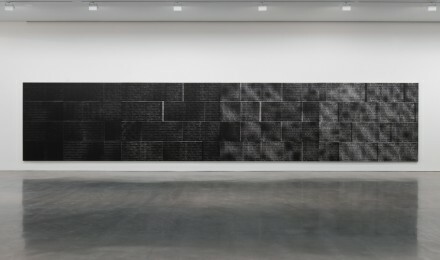 The result is a mass of worn and fading hands reflecting the strong undertones of the piece. Glenn Ligon: Well, it’s bye-bye/If you call that gone is on view at Regen Projects through April 18, 2015. *All images are Courtesy of Regen Projects Los Angeles. 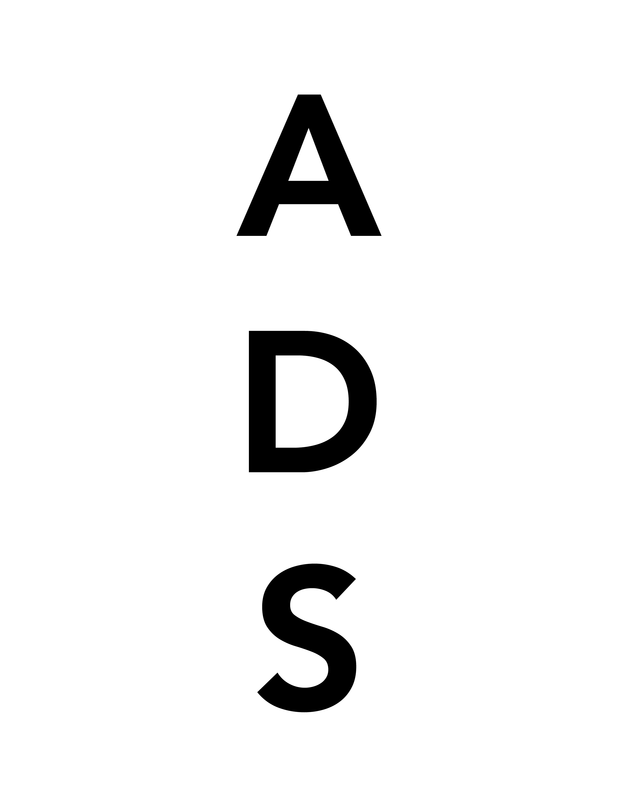 This entry was posted on Wednesday, April 15th, 2015 at 8:19 am	and is filed under Art News, Featured Post, Show. You can follow any responses to this entry through the RSS 2.0 feed. You can leave a response, or trackback from your own site.